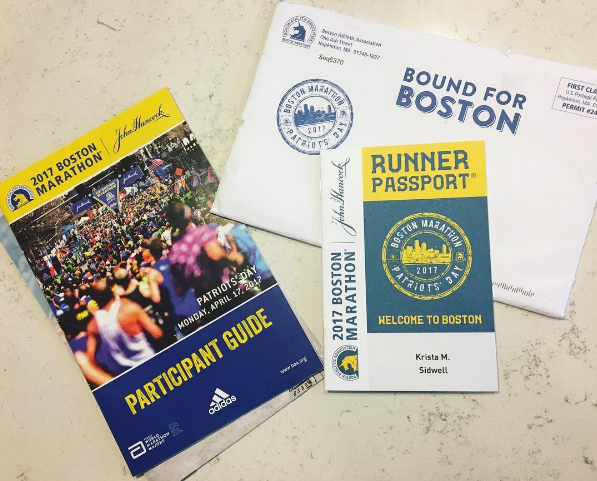 Choosing to return to the Boston Marathon for the third consecutive time was not something I was sure about. As a matter of fact, even after registering, I didn’t choose to race it until a few weeks before the race. Not because the Boston Marathon isn’t fantastic and awe-inspiring; of the 11 marathons I have ran, it is still my favorite. But, I was flirting with a different marathon that was two weeks after Boston, and I didn’t feel I could do them both well that closely spaced. However, the idea of missing out on the Boston Marathon didn’t sit well with me. It is such a fun event to be a part of. I also had a score to settle with the course. The year before, I ran it injured with a grueling 5-hour marathon finish time–a full 90 minutes slower than the first time I ran the course. I didn’t want to exit the marathon that way. I was also lured by the idea of running the course with two of my friends who had qualified and who planned to be there (Sharolyn Lindsey and Annie Ballard). Sharolyn was running it for the first time and I was excited to share in that with her! These ladies are golden! I contacted Annie and mentioned that I was more seriously considering running Boston. She encouraged me and even offered me to bunk up with her at her AirBnB. My plan was to fly in on Sunday, hit the expo, go to sleep, run the marathon on Monday and head home that evening. I didn’t need to sight-see. And, I didn’t want my race to keep me away from my family nor be a huge expense. I booked my flight with Southwest points, gave up my spot in the REVEL Mt. 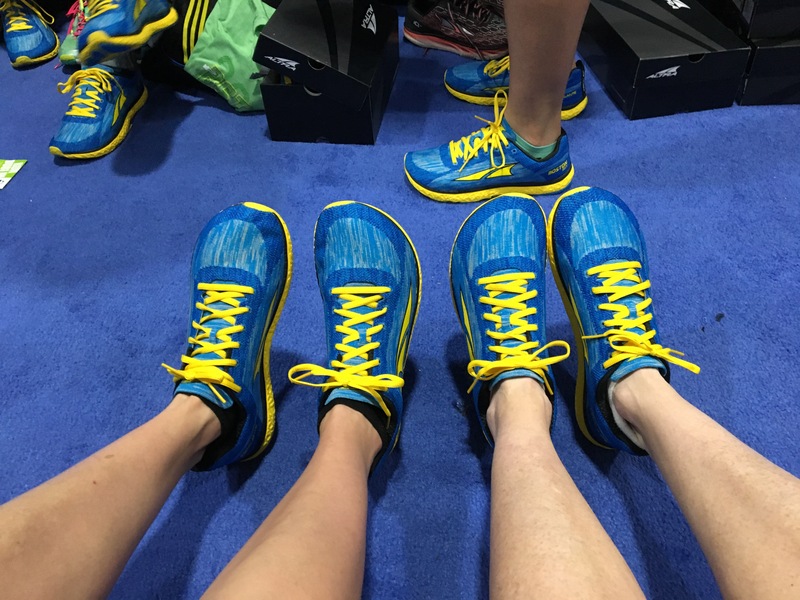 Charleston Marathon I was planning on running a couple weeks after Boston and committed myself to the 2017 Boston Marathon. Injured in February of 2016 with a gastrocnemius calf tear and deep vein thrombosis blood clot, I worked hard to rehabilitate. Some things healed, some things still haven’t from that bitter winter. The cold temps and the convenience of an in-home gym (given an increase in the number of hours I was writing a day for work) had me doing 95 percent of my training on my treadmill. It was an arduous process recovering, but eventually I was maintaining a 6:30 per mile pace and feeling ready to really give breaking the 3-hour marathon a go. 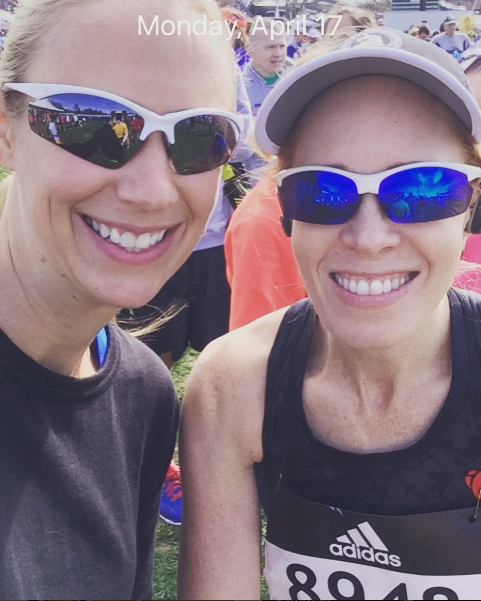 My experience at the New York Marathon the November before–hitting the wall for the first time in a race–shook my foundation and my faith in my abilities and training. Shaking that was tricky. After months of rehabilitation efforts, working on getting faster and constantly striving toward my marathon goals I was also feeling a little burnt out. I wasn’t finding the same joy I had found in running before. Reaching my running goals was starting to feel more like something I was driven to do for all the wrong reasons; it had lost its fun. I had lost my fire. Going into the Boston Marathon, my head just really wasn’t in it, but I was driven, almost mechanically, forward. The decision to fly in the day before the race was a good one. 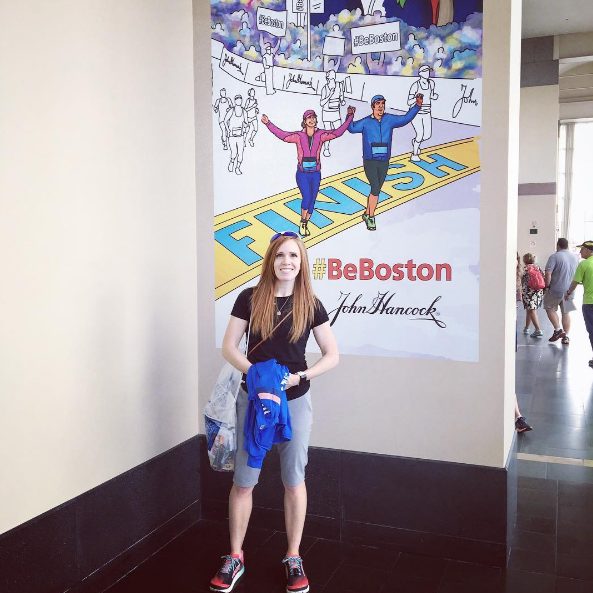 The last two marathons I had come into Boston with too much time before the race; I was on my feet too much, I wasn’t able to carb-load the way I wanted, and I was thinking too much about the race. Back at home, I saw posts of racers in Boston touring and enjoying the pre-race fun, but was SO glad I could be apart from the stress that that causes before the marathon. If you do want to sight see, do it AFTER the race! Arriving in Boston on marathon eve, alone, was a little surreal. I took an Uber to church and met up with my friends. Following that, we hit the expo. The expo only had a few hours left when I arrived, but the only real drawback of that was that some of the sizes for clothing I wanted for myself/children were gone and all the commemorative unicorns they put out each year were gone. (My daughter likes those). 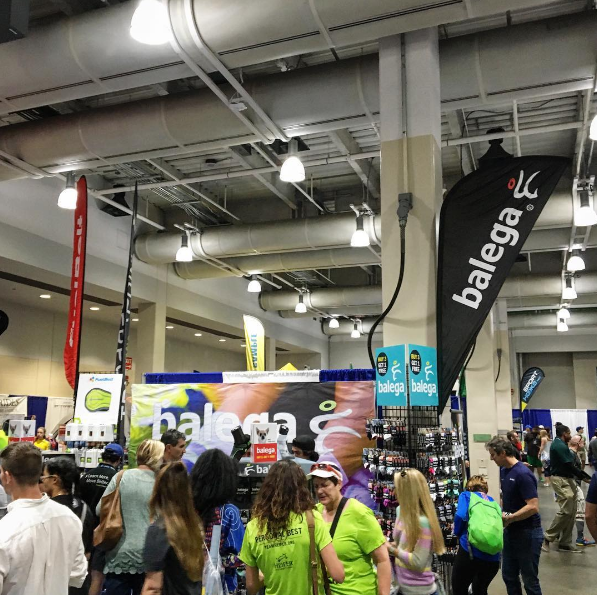 I was excited to be with my friends at the expo; I was beginning to feel the marathon energy and pre-race excitement. Getting my bib is always an exciting highlight. Being in Wave 2, Corral 1 was something I was proud of! 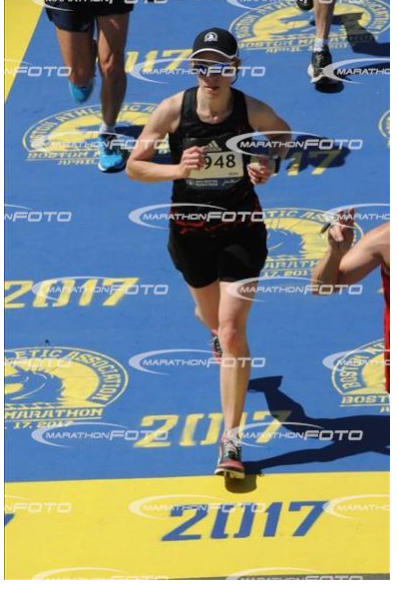 After New York, I knew that breaking the 3-hour mark was not going to happen for me at Boston in 2017. My goal turned to trying to beat my 3:13 marathon PR. My goal was to leave the course feeling like I had redeemed myself from my performance at Boston the year before and from my horrendous experience on the New York Marathon course 5 months earlier. Anything had to be faster than running injured the year before at Boston! I made a reservation on Open Table before I left Colorado so I wouldn’t have to worry about finding a good, carb-heavy meal the night before the race. 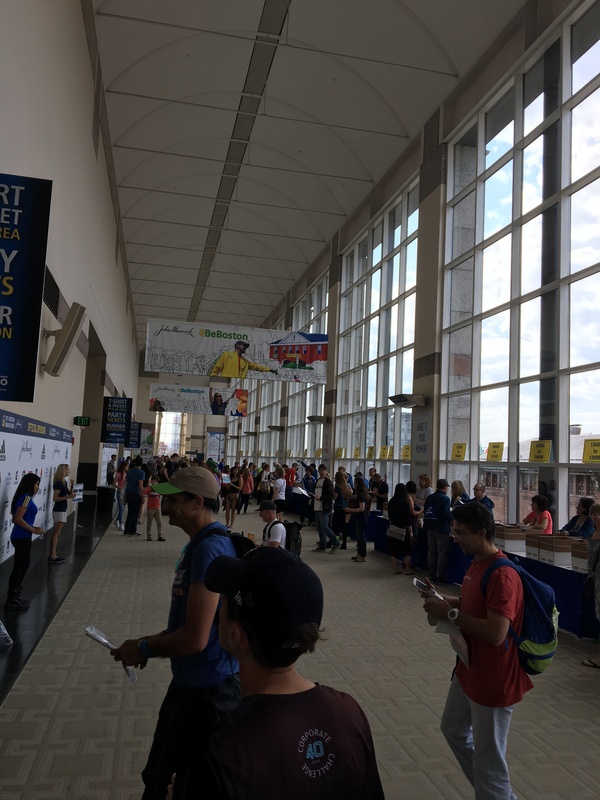 (My first year I attended the official Boston Marathon race dinner, but was left feeling like the line was waaay too long to wait in for food that wasn’t worth it. My friends and I went to one of my favorites in North End and made sure we didn’t leave that part of town before securing some Florentine Cannoli from Mike’s Pastry–thank you Annie–to take home to our families. 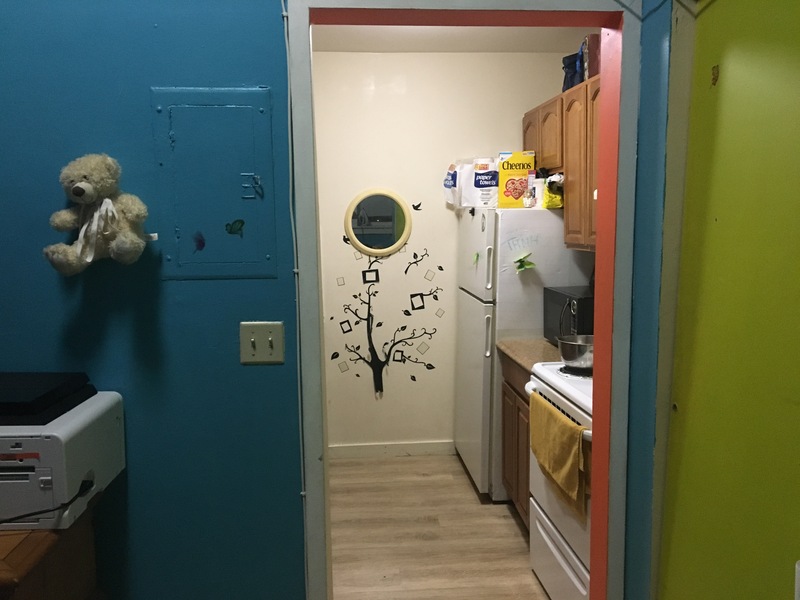 So, my first experience with AirBnB turned out to be a disaster. My sweet friend and I found ourselves in a smoky, dimly-lit accommodation hosted by a woman we had come to learn was anything but forthright. The ethnicity of the host really made no difference to me–why should it? ?–but apparently she thought it would. 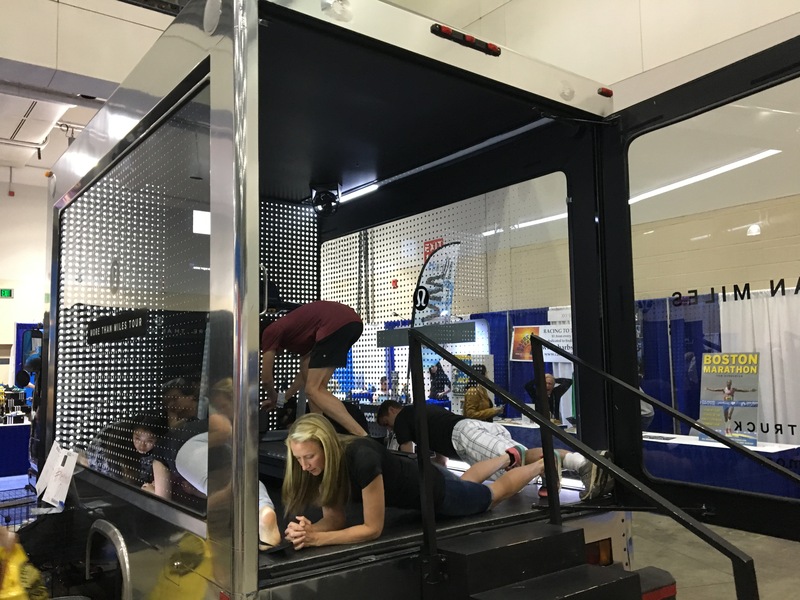 She advertised the room as belonging to a young, white, blue-collar couple, but we later learned, after she refused to talk to us or see us–and from the Black Lives Matter poster in the closet–that she was of African-American descent. Perhaps she felt that her race would affect her popularity on AirBnB?? Don’t know…. Sad. Her dishonesty, coupled with arriving to find the studio apartment door unlocked AND her dodging meeting/talking with us, started to make us feel a bit unsettled about the whole arrangement. We couldn’t find the promised air mattress and when we did uncover it we couldn’t find sheets to cover all its dust. It was also like 5 feet long….Worried that it may not retain its form through the night, and the lack of sheets and cleanliness, Annie–being the amazing friend she is–demanded I share the queen bed with her. We prepared for our early morning. I tossed and turned all night. The smoky room was irritating my lungs, and the stuffiness of the room couldn’t be helped since we were on the ground floor and opening a window felt a little too precarious in this unknown area of Boston. I had weird dreams all night of our nameless, faceless host opening the front door and coming in during my sleep! Worried I would disturb Annie’s sleep, I tried not to make a sound, or move too much but it was a rough night. A poor-night’s sleep in a questionable accommodation wasn’t the only thing that was getting my race day off on the wrong foot. Before entering a bed I sincerely hoped was free of bed bugs, I discovered that I had left my pace watch charger in Colorado and my watch was in desperate need of a charge. At 8pm in the evening, there was nothing to be done about the missing charger; I would just have to see how long the battery would last. Sigh. One of the highlights of this trip was being reunited with Mike and Sharolyn Lindsey who had traveled with Stephen and I to New Zealand a few weeks prior to Boston. (I just love this couple!) Having Mike there was so helpful too! They had a rental car and he drove us where we needed to go. I was so grateful to see their car show up at the AirBnB that morning. He gave Sharolyn and I a ride to the buses for the athlete village and I said goodbye to the AirBnB for the day. 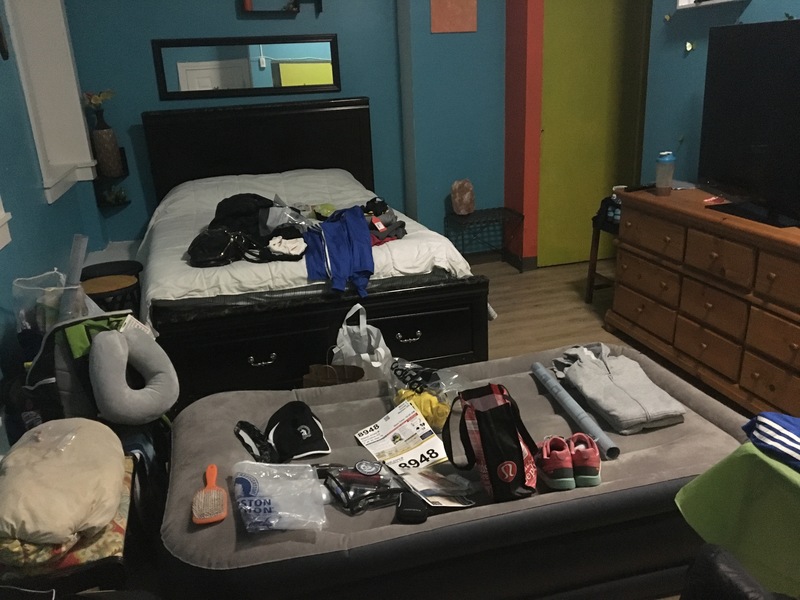 The shady actions of our host made me wonder if my things would still be there when I returned later that day after the marathon. . . . The ride to the village, and our time in the village, was another highlight of the event. Annie left early that morning on foot because she had qualified for the first wave–no small feat–and needed to meet the buses earlier. We met up with her briefly in the village so I could give her the keys to our AirBnB studio, and then she was off. I was feeling REALLY nervous about my pace watch surviving, and the heat of the day since it was already really warm, but, mostly, I was just excited to get the race underway. Sharolyn and I were in the same wave, but different corrals. Since I was going to try and accomplish a PR, we said our goodbyes and I went to join the other racers in corral 1. Everyone that had qualified for wave 2 corral 1 were really fast runners so it was fun to rub shoulders with them and chat while we waited for our turn to cross the starting line. Early on, I felt that my body was tired. My heart-rate spiked early with my 7:20ish pace. I worried about what that would mean for the later part of my race, but just kept pushing. I worked to stay on pace and still enjoy the experience. That course is so scenic and so full of energy. The crowd is so encouraging and fun. I was having a pretty good time on the course until about mile 12. Around mile 13 I started to notice that I didn’t have as much umph. By the time I hit the Newton Hills at mile 16, I knew I was going to have to readjust my goals. I let my body slow down to an 8-mile pace and just kept moving. At mile 19, my watch died. This was really unfortunate because I really needed it. I had hit the wall and was needing all the help I could find to finish this race with even a B or C race goal. 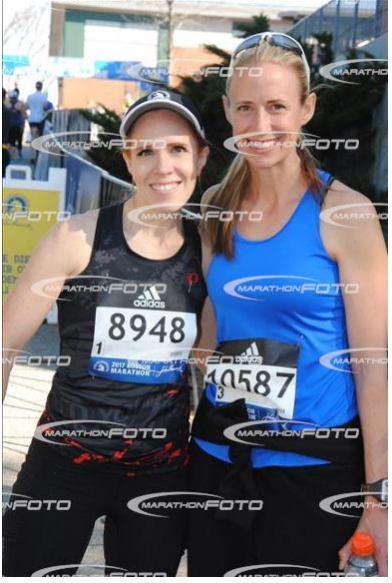 At the very least, re-qualifying at the Boston Marathon was something I wanted to achieve! I walked through all the water stops, but kept on moving. The wall left my body stiff and reluctant to grant me any of my former speed. I couldn’t even guess what pace I was running. My lungs heaved. The heat was strong, the sun merciless. My mental strength was flickering out and I found myself feeling very similarly to how I had felt on the New York Marathon course in November. I was frustrated, hating the race, cursing the reason for running marathons in the first place and just wanting to be home. I think I was deciding to retire from marathon running at that point. . . . After months of working towards a faster race time, I had failed. I couldn’t get my mindset where it needed to be. I couldn’t find the light; the strength; the will. But, but I kept on going as fast as my body/mind would let me. I kept on working, all the way to the end. I knew I would at least have that. I wouldn’t quit. I would finish the race. I would give it all I was a capable to give it that day. Sometime right before my first sighting of the infamous CITGO sign, I noticed larger-than-average crowd noise soon followed by watching what appeared to be a near-naked, barefoot aborigine passing me on the course. 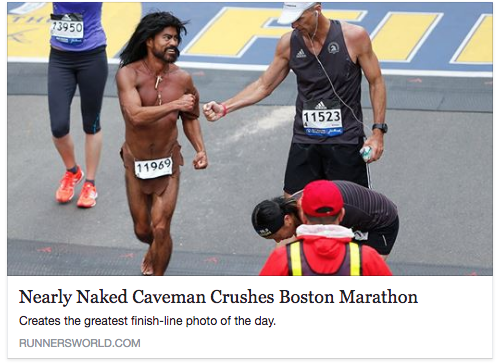 Clad only in a g-string loin cloth, this dark-maned physique cruised by me at a pretty decent clip! You see lots of things on the streets of the Boston Marathon, but this was the best of the day. He made me laugh right when I really needed to laugh. 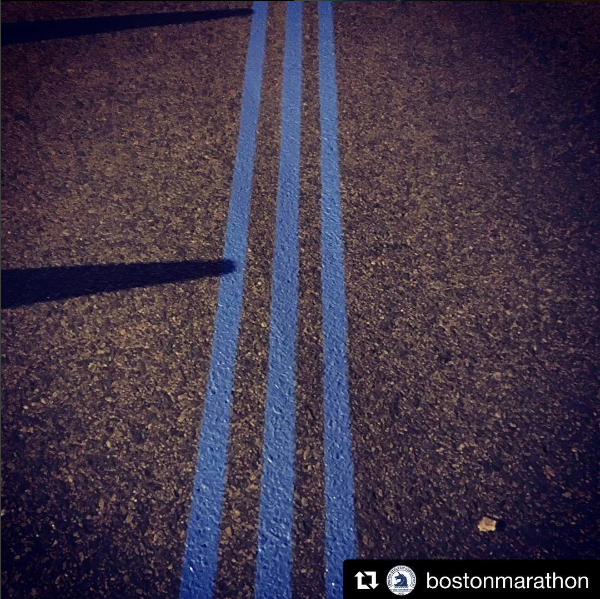 When I saw the blue stripe under my feet indicating that I was a mile from the finish line, I found some kick. 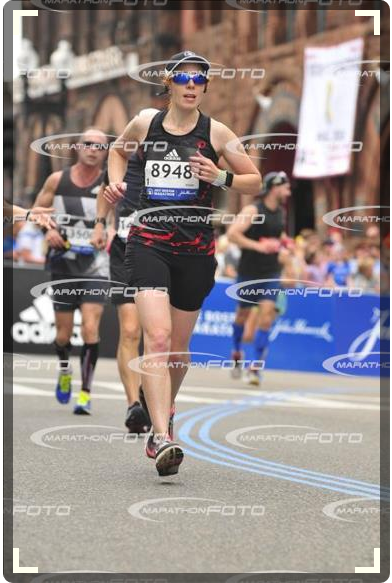 I actually felt like I took Boylston Street at a pretty good clip. The extra umph I had that last mile revealed that I could have been running faster. Had I had a working pace watch, I have no doubt that even though I had hit the wall, I would have re-qualified for Boston. As it was, I crossed the 121st Boston Marathon finish line at a 3:46:34, 1 minute and 34 seconds too late to BQ. Not exactly in the best frame of mind when I crossed the finish line, I also developed a keen awareness to the soreness in my hips and feet. I was a slow-moving mess. I usually feel pretty good when I finish a marathon. Not so that day! I retrieved my phone from my pocket and saw a text from Annie. She had finished in an amazing 3:15 time despite a hamstring injury and had booked it to our AirBnB because our host had contacted her–while she was running the course–informing her that we needed to check out. Annie explained to her–while running–that we wouldn’t return until after the race; that she was running the course right then. The host, who had apparently forgotten this important detail of her guests itinerary demanded that we return and hung up. Annie returned after the race in haste and tried to grab a quick shower before I got back. She was interrupted by the host entering the studio apartment and telling her to get her/our stuff and get out. Seriously. So, I’m shuffling towards the marathon exit streets, talking to Annie on the phone and she is telling me that she (and her sister and husband that had come to the race finish) had gotten all our things and that they were waiting for me at a park about a block away from the cursed Brownstone we had spent a shady night in. I should have been able to walk there–it was just a little over a mile–but my hips were so sore that every step was excruciating. My brain wasn’t working. I hadn’t grabbed a recovery bag at the end of the race, just a failing heat shield and I was wandering lost. I decided to call an Uber and tried to find a street outlet from the masses and street closures that the Uber could reach me from. This required more pitiful, snail-pace walking, but I finally found a corner to wait at. The first Uber couldn’t get to me and cancelled after I had been left waiting–on my aching feet–for 15 minutes. The second Uber got to me and I wanted to cry. I forced my limbs to bend and got in his car. It took us 25 minutes to get to the park because of all the people and traffic even though it was only like a mile away. When I finally got to the park, I was in bad shape. And I was freezing. I needed to get out of my wet clothing, but there was no where to change so I rummaged through my bags–in the park–and found some clothes to put over my sweat-soggy race clothes. The time it had taken me to get to the park had seriously encroached on the time we had before we needed to be at the airport for our flight. We called an Uber and went straight from the park to the airport. We arrived at the airport with considerable time, so we found a family restroom and went in and locked the door. We stayed in there for like 45 minutes while I tried to recover, change, and make sense of myself and my situation. Annie clued into my lack of mental awareness and demanded I drink her recovery drink that she had received at the finish line. Once I got that in me, I got out of my wet clothes as she helped me wash my hair in the bathroom sink with her shampoo. This sweet, angel friend washed my hair for me while I gripped the sink and tried to stay upright. After the calories started to restore my system, and my temperature started to rise from shedding my wet layers, I began to feel less convalescent. I will never forget that airport-beauty-salon scene. By the time we emerged, I actually felt pretty refreshed and was moving at a normal speed again. (Recovery drink success!) We hit the security line and then hunted down some airport carbs before our non-stop flight to Denver. Annie and I weren’t able to sit by each other on the plane, so I plopped myself between two strangers and tried to make myself comfortable for the 4.5 hour flight. 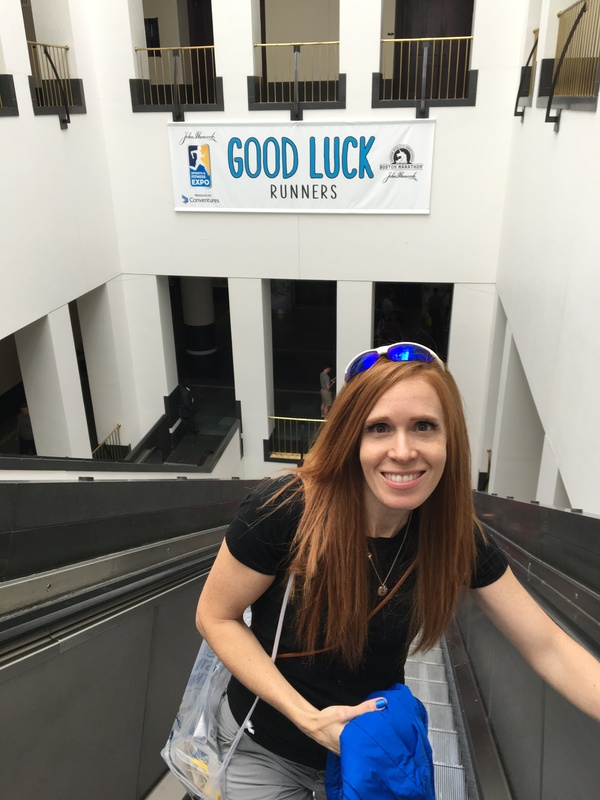 Lucky for me, my post-race soreness really isn’t bad the day of the marathon–it peaks about two days out–but, my limbs still rebelled at the idea of being in one position for so long. 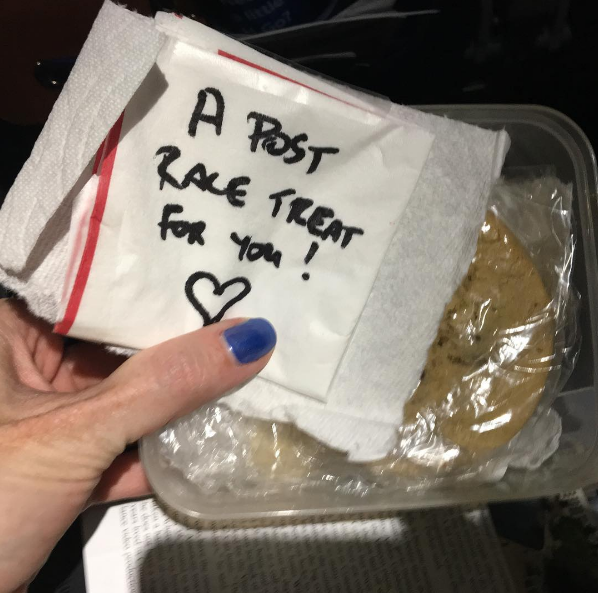 I pulled out the surprise chocolate chip cookies my husband had hid for me in my bag–my number one craving after a salty cheeseburger post-marathon–and let my mind sort itself. That was a sad flight. I couldn’t help the tears from brimming in my eyes. All those months of effort to hit the wall. The disappointment I felt was just overwhelming. I could find no real satisfaction from any of my efforts that day. I was going to need some serious time away from marathoning to try and recapture my fire for it. I was being too hard on myself–for sure–but, I am wired to work hard, perform and achieve. I don’t take anything less very well. 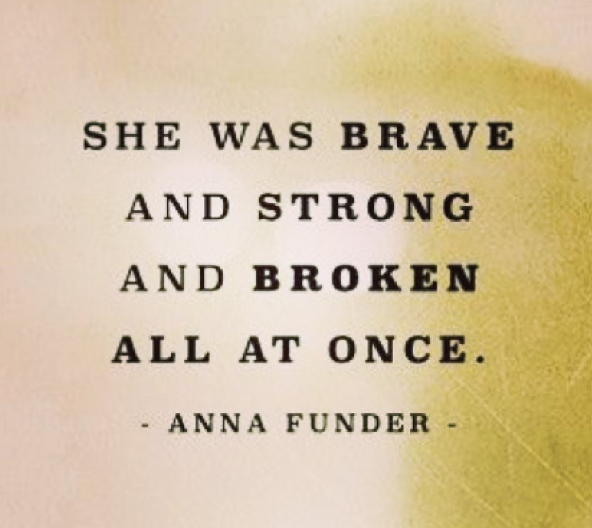 Never have. I know, I know, lighten up already. Don’t take things so seriously….I know. Major character flaw identified. One of the biggest lessons I learned from this marathon was that you have to train on the type of terrain you race on. All that treadmill running/training didn’t prepare my body for the speeds I was attempting on the course. My body may have been able to sustain those speeds on a 1 percent grade, predictable incline/surface (treadmill) but the muscles you develop from running on changing, turning, self-propelled surfaces are crucial for 26.2 miles of sustained effort. Hitting the wall was just inevitable. Secondly, I will, quite possibly, never forget my pace watch charger ever again. That error really messed up my final 10k of the race and cost me a BQ. Thirdly, for the 2018 Boston Marathon I have already booked a room right at the finish line at a reputable hotel–no AirBnBs for me again pre-race. And, finally, regardless of how fast or slow you run a marathon; regardless of whether or not you take that flight back feeling victorious or defeated, the fact that you finished has added something to you that wasn’t there before. This is true in so many facets of our lives. Challenge yourself. Test yourself. Do your best. Don’t quit. Every experience in our lives–the good and the bad–shape us and prepare us for all the bumps and slides along the course of life. I didn’t give up. I finished the race. I learned and left the course with plenty of knowledge/experience to apply to my next life event. I will be returning to the Boston Marathon course in 2018 for my fourth consecutive year. How I got there again is outlined in a post to come: The Deseret News Classic Marathon.